Alicia Barney’s work raises questions related to ecology, strongly criticizing the capitalist model of development and its relationship with nature. Some of her works link elements of the landscape to environmental issues, such as when she exhibits polluted water collected from the Cauca River in Colombia (Río Cauca, 1981-1982) or air collected from an industrial zone and exposed in glass cubes (Yumbo, 1980). Convinced that aspects of daily life integrate into artistic practice, Barney also developed installations consisting of objects and materials gathered from her surroundings (Diario objeto I and II, 1977 and 1978-1979 and Un día en la montaña [A Day at the Mountain], a piece from series II). Through the idea of a female-shaman artist, she underscores the magical or ritualistic character of her connection with these objects, reclaiming the acts of the Pre- Hispanic indigenous peoples. In Valle de Alicia [Valley of Alicia] (2016), Barney interferes with the scenery of the Ibirapuera Park, constructing an instrument out of tubes, resembling an organ, to be randomly played by the wind. 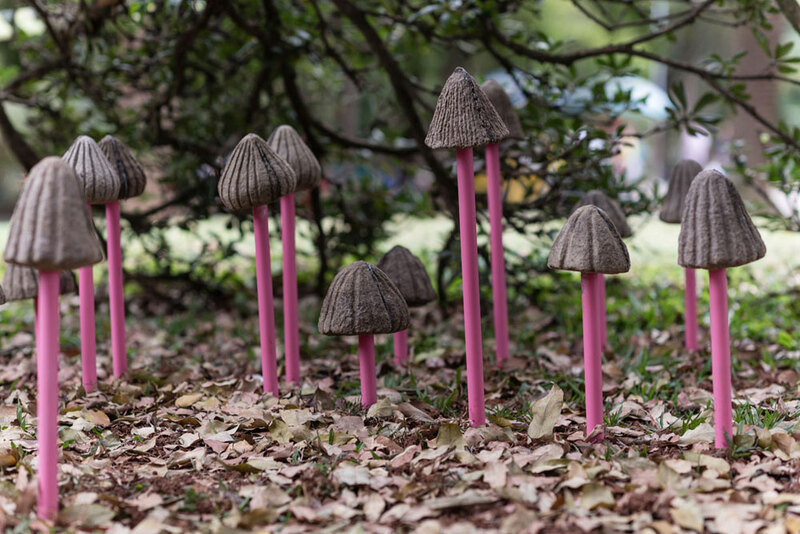 Along with the instrument, sculptures of mushrooms made of paper and resin are also installed, adding a psychedelic layer to the landscape, linking action to chance, stimulating the senses and altering our perception of everyday life.